This is a great shake for pregnant women especially in their first trimester, when they have a lot of morning sickness and have loss of appetite. This drink is not only filled with calories and natural sugars but also provides all the vital nutrients like calcium, protein, vitamin B12, iron and omega 3. Vitamin B12, protein and iron will meet the mother's increased requirements. Calcium will help in developing babies' bones, while Omgea-3 will help in the babies' brain development. If you are tired and not in a mood to cook, you can just have this drink and get all your nutrients in just one glass of this drink. 1. Soak the dates and almonds overnight. 2. 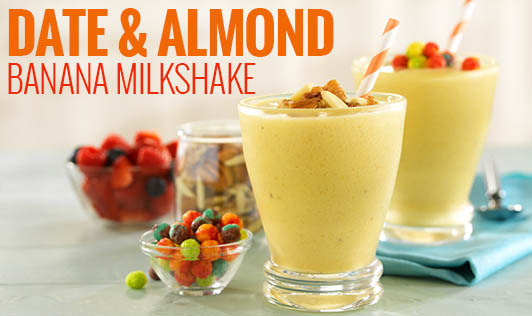 Blenderize the banana, dates, almonds and milk together in a mixer until smooth. 3. Pour in a tall glass and top it with ice cubes. Serve immediately. • You can add 2 tsp skim milk powder to increase the protein content further.